Routes de la Lavande: Into the Baronnies Provençales ! In the heart of the Baronnies Provençales, from Nyons to Ferrassières, you enter this territory from the north, towards the South. Along the way, Provence is becoming more and more present. Listen, you are there. The Provencal melody is at your fingertips. The concerto of the cicadas begins near the apricot trees of the Ouvèze. The nocturnal grillons later sing their chorus, riddled with the subtle scent of lavender fields, near the juicy pear trees of the Méouge. The warm thrill of the Baronnies lime trees sublimates the tempo. This path is sung, danced, lived, with the five senses. The route is passable from April to November. Some areas in the plain can be visited all year round. Outside the summer flowering period, spring (May, June) and autumn (September, October) are ideal, especially for photographers and discovery enthusiasts. And most offers are available to welcome you. If you want to admire the lavender in bloom, the months of June and July are those to privilege. We invite you to consult the flowering periods according to the geographical sectors. 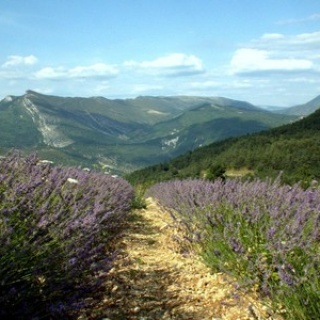 From Nyons, in the Eygues Valley, between the olive trees, the lime trees, the walnuts, the truffles, the vineyards and of course the lavender, the Baronnies reveal along the route extraordinary natural sites, such as the Saint May gorges or the Soubeyrand pass. The very badly named vallée de l'Ennuye will be a feast for the eyes, between lime, lavender and apricot, a local production highly prized specialists.